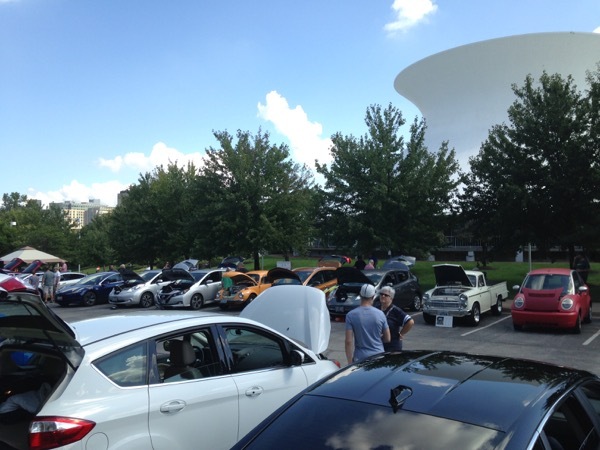 The St. Louis NDEW event had many different types of electric vehicles. Several members of the Carlyle IL NDEW event (held the previous day) attended. EV owners talked about their vehicles while several members of the Tesla group gave rides. The local electric company (Ameren MO) had a booth with information on their project to develop charging infrastructure in Missouri. It includes 40 "charging islands" along the interstates as well as workplace and multifamily charging rebates. Electric vehicles and people in the St. Louis Science Center Planetarium parking lot. We will have a wide variety of electric vehicles on display. They range from conversion to manufactured electric vehicles including a Nissan LEAF, Chevy Volt, Chevy Bolt and Tesla. Owners will be on hand to talk about their vehicles. There will be brochures and other information available on electric vehicles. Some vehicle owners will give rides. Registered attendees report 1,347,991 electric miles driven.